Scared of Snapchat for Business? Regardless of the frivolity associated with the social media platform, Snapchat is here, and it's here to stay. Check out these insights from Digital Summit MPLS. Scared of using Snapchat for your business? You’re not alone. But it may cost you long-term growth. So get over it and start engaging your audience where they live. 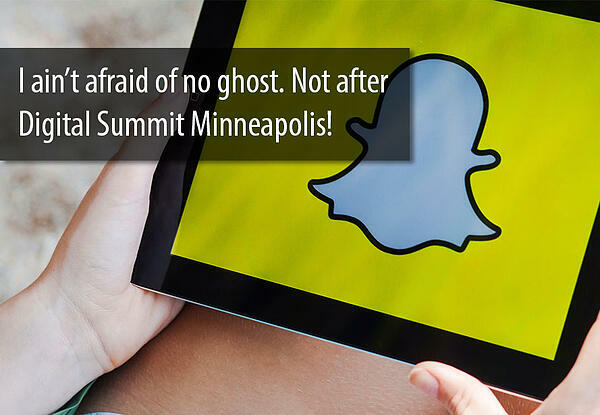 That was the key takeaway from Carlos Gil’s presentation, Snapchat for Business, at Digital Summit Minneapolis last week. Regardless of the frivolity associated with the social media platform, Snapchat is "IT" and "IT’S" here to stay, proclaimed Gil, Head of Global Social Media for BMC Software. As we all know, millennials dominate Snapchat’s user base (primarily 13-35 year-olds), sharing disappearing photos and videos at increasing rates. In fact, there are 10 billion daily video views on the platform. That’s 2 billion more than Facebook on a daily basis. Gil suggested that engagement on Snapchat may be higher because the photo and video content, known as “Stories,” disappear after 24 hours. There’s a potential fear-of-missing-out (FOMO) principle at work. Why should your business care about Snapchat? Because millennials are expected to outspend boomers for the first time starting in 2017, said Gil. If you aren’t using Snapchat for business and your potential customers are using the platform, you may be missing out on a growing audience. Gil said businesses that have already adopted Snapchat in their marketing are a step ahead in converting customers using micro content storytelling. However, "There is no instant ROI in social media," he added, "you have to grow, engage, and then convert." So don't expect to fly out of the gate with measurable returns. 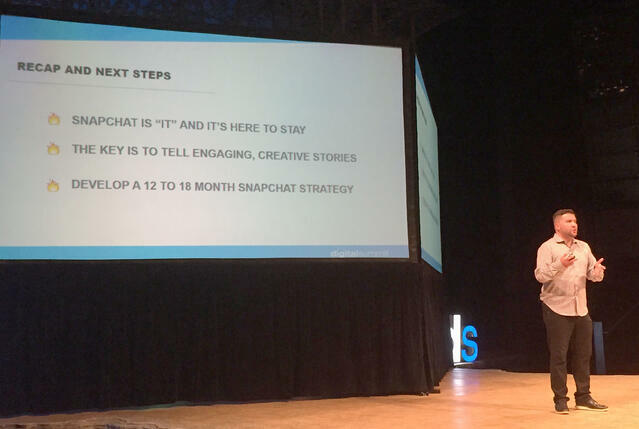 Snapchat content should be fun, creative, informative and engaging, he said. Mainly, you should be real. That’s why some companies are allowing employees and influencers to “takeover” Snapchat accounts for short periods of time. It’s a way to humanize a brand and extend reach. People want to engage with people, not brands, said Gil. In the B2C world, advertising on Snapchat has secured a toehold. Like other social media platforms (we're looking at your Facebook and Twitter), once the demographic shifts a bit (and those millennials continue to age), niches and audiences will be carved out for B2B services to move in. The first ones that do (and already know how to use the space properly) are positioned to pick up business before the competition. Are you ready to use Snapchat for business, or are you still scared of the platform? Let us know your thoughts in the comments below or contact us to discuss your social media and content marketing strategy.